Poverty is not our destiny. 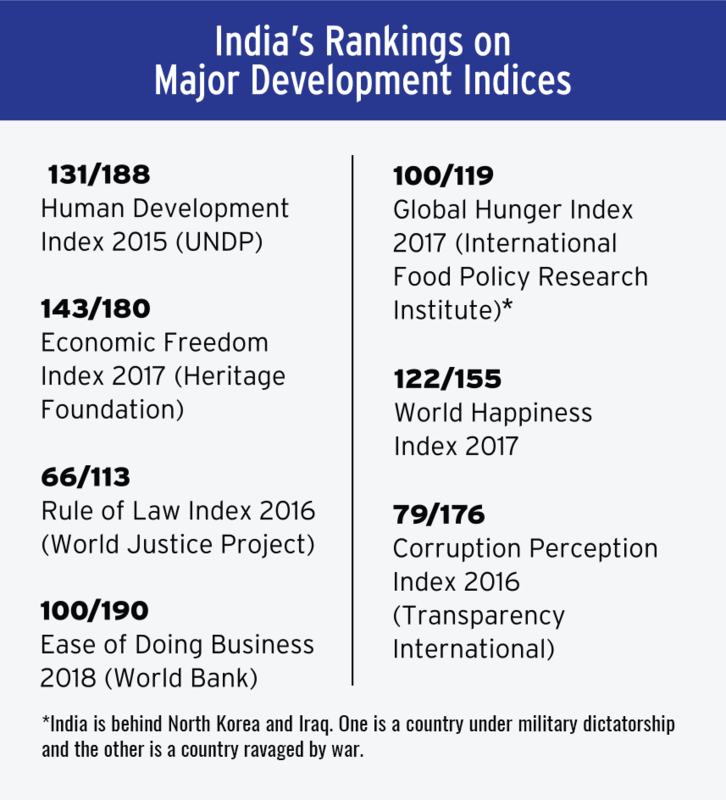 India should have been a rich, developed nation by now but it is not. That we in India are not at least 10 times richer that we should have been is a matter of great disappointment. People can and do create prosperity when they are free to produce and trade. But governments interfere in wealth creation. The politicians and bureaucrats do this out of ignorance, greed and a hunger for power. They do not understand why nations are poor and what can be done for prosperity. They centralise decision-making and make it discretionary and therefore create wealth usurping opportunities for themselves. Their desire for power makes them use the force of the state to discriminate between people and thus carve out a selectorate whose votes they can rely on. They want to enrich themselves and prolong their stay in power at all costs. Thus functions the anti-prosperity machine. Taken together, every component of this machine works together to ensure that we Indians as continue to stay poor. This has been India’s tragedy right since independence. A command-and-control government that took over did not educate young India – all it needed was one generation to be fully educated. Indian enterprises and entrepreneurs needed to left free to compete – instead, what they got was a licence-permit-quota raj. Government resources (collected from taxes paid by people) were misdirected. Instead of economic freedom, we got economic oppression. The anti-prosperity machine once constructed kept growing under every leader whom the people of India voted with great hope. No government destroyed the anti-prosperity machine. Every government grew it. A few cosmetic changes were done. But to this date, the machine is running. It is now under new management – a political party and leader who once promised “minimum government and maximum governance” so he could win an election. Unfortunately, promises do not create prosperity, only policies based on the right principles do. So, the question is: who can destroy this anti prosperous agenda? The answer is obvious: it has to a political startup, a new force and movement in Indian politics. 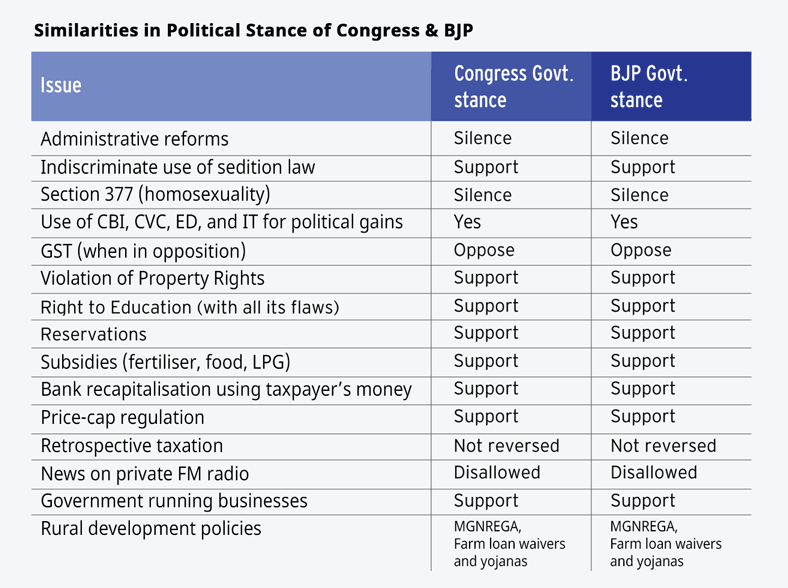 The existing political parties and leaders in power have little or no incentive to change India’s direction, and thus have kept India on the same path of extraction and exploitation as the colonial rulers. Their sole purpose has been to stay in power, for which they have kept Indians poor and dependent on government handouts in return for votes. The prosperity of Indians is not their objective. Consequently, economic policy has been remarkably consistent across all governments and political parties – laden with pro-poor rhetoric without actually benefiting the poor. India’s rulers have changed, but the rules have not. And without changing the rules, outcomes will not change. Without smashing the anti-prosperity machine, we are not going to become free and prosperous. 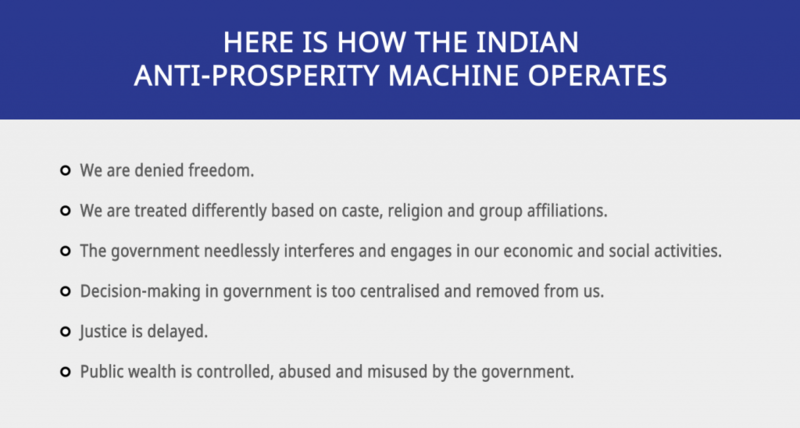 The time has come to create a new political startup which has a single agenda: to crush India’s anti-prosperity machine, and make every Indian free and rich by electing India’s First Prosperity Prime Minister.